(Newser) – The last photo Colleen Burns posted to Instagram shows her sitting at the edge of the Grand Canyon. "That view tho," she captioned it. Hours later, the 35-year-old fell 400 feet to her death when she slipped off a ledge Friday morning. Park officials announced her death Monday, the AP reports. "She was, like, stepping out of the way for another gentleman to kind of squeeze in, and unfortunately Colleen just kind of got tripped up on her own feet and fell backwards, fell into the canyon," a friend who was with Burns on the sunrise hike tells WESH. "That was the longest, strangest, craziest two seconds of my life." This is a very sad story. I've never been to that place, but know generally that there are many places where it's just not safe to move aside to let someone else pass. For safety, courtesy has to be set aside. The person who wants to get past will just have to slow down and stay behind until there's a safe place to pass. Even so, people have to be super-careful in places like the Grand Canyon, with so many sheer cliffs. Some people either don't have the caution born of previous experience, or the coordination needed to yield and get back in hiking location safely. 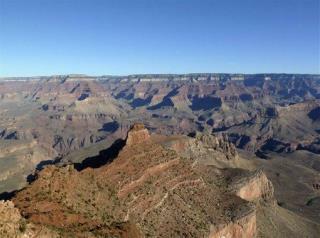 I can't afford a phone with a camera now, but when I can visit the Grand Canyon, I won't be taking any selfies.